Easy recipe for Crunchy Fried Butterfly Shrimp. Butterflying shrimp makes more surface area for the best part, the crunchy and crispy coating. Serve with cocktail sauce and lemon wedges for the perfect plate. First things first, you will need to butterfly the shrimp. The easiest way to butterfly shrimp is to start with a thawed “easy-peel” shrimp. Peel of the shell while pinching the tail, you want to keep the tail so that you have a handle of sorts for the breading process. The easy peel shrimp should be deveined already. Take a sharp knife and run it along the opened area, cutting down towards the other side, but DO NOT cut all the way through. Gently pull the shrimp apart and finish cutting any portion of the shrimp that might be preventing the shrimp from fully opening like a book. If you are using shell on shrimp it will need to be peeled and deveined. Always use thawed shrimp before attempting to peel or devein. Deveining and peeling can be done all at once by using a shrimp deveiner. It can also be done with a sharp knife. Hold the shrimp with vein side up. Stick the knife or deveiner, sharp side up under the mud vein and gently push the knife back to the tail section. Start cutting the shell from the head section. The shells should split open and the mud vein should be easy to remove. Try and keep the tail section on. Another method for deveining and peeling shrimp is to use a sharp pair of kitchen scissors. Start cutting the shell and meat over the mud vein and stop before getting tot he tail. Remove the vein and shell. Once the shrimp has been peeled and deveined, use the method above for butterflying the shrimp. Don’t worry about the “vein” on the other side of the shrimp. That one is not part of the digestive tract. 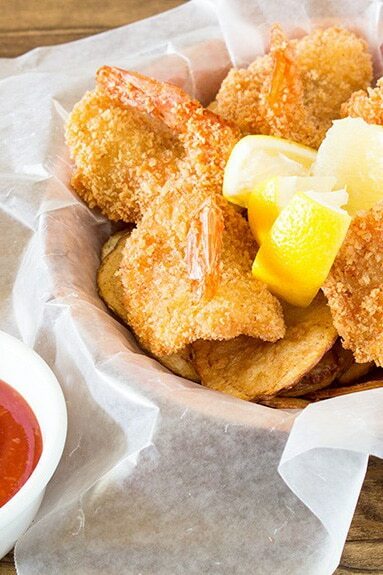 Battered and Deep-Fried Butterfly Shrimp is not difficult to make at home. I usually start with frozen shrimp I have thawed. The only drawback to making them is that they are time-consuming to make. And they are only time-consuming because shrimp are small. Even large shrimp requires you to repeat these steps at least 6 times per person if you are serving this for dinner. Since I tend to buy them frozen, it allows me to buy larger shrimp when I find them on sale. You can buy them “fresh” from the seafood counter, but ask them if they were frozen previously first. If they were, skip the up-charge and buy them frozen. They take no time at all to thaw out. You could probably get away with 2 or 3 smaller shrimps as an appetizer, but if you are going to go to all the trouble, do you really want to mess up the kitchen for a few shrimp? Go ahead and coat all of the shrimp and freeze them for cooking later. When cooking a large amount of fried shrimp, I keep the cooked shrimp in a 200 degree F oven. This keeps them warm and crispy until all the shrimp are finished frying. My preferred oil for these is just plain vegetable oil. Peanut oil is another great choice, but I find it a little pricey. To freeze the shrimp, just place them in a single layer on a plate or baking sheet that has been lightly coated with panko breadcrumbs and place in the freezer. Allow shrimp to freeze completely. Remove from plate or baking sheet and place in a freezer bag. Butterflied Shrimp can be cooked from a frozen state, just like the ones from the grocery store in the yellow and blue box, except these taste better. To cook from a frozen state, just fry them the same way you would fry them on the day you made them. It may take an extra 30 to 60 seconds to cook, but they will taste the same. Deep Fried Shrimp is the same thing as fried butterfly shrimp, except you do not butterfly the shrimp. When you peel the shrimp, you should still leave the tail. I leave the tail so I have something to hold on to while I am breading the shrimp and for when placing them into the hot oil. 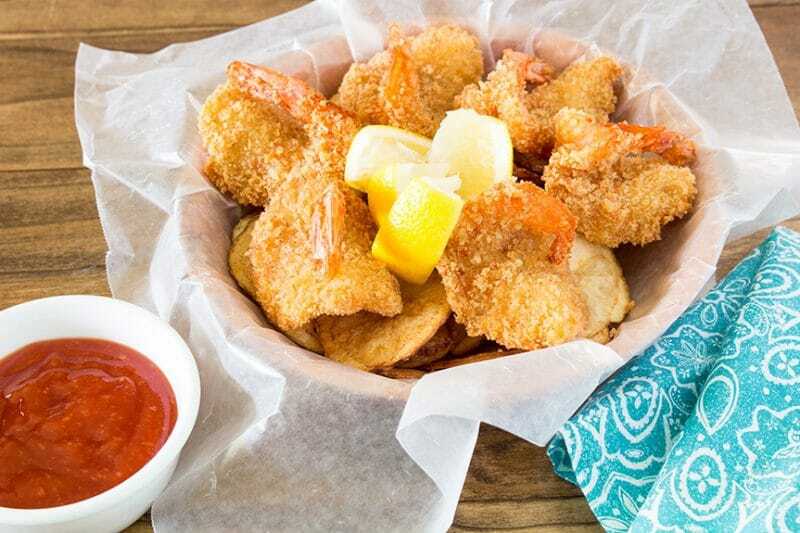 The difference between Fried Butterfly Shrimp and Deep Fried Shrimp is that Butterflied shrimp has a higher breading and crunch to shrimp ratio. Since you will already have hot oil, why not add some homemade potato chips to the mix. Just scrub some potatoes, any kind, and slice them fairly thin. Soak them in some cold water for at least an hour. I have soaked them for up to 6 hours without issue. Right before frying, dry the slices on kitchen towels. Do not overload the pan with potato slices, the oil will bubble like mad when you first add the potatoes. Stir them around occasionally. fry until desired crispness. I keep mine warm in a 200 degree F oven. I also keep my shrimp in the same oven until serving time. Easy recipe for Crunchy Fried Butterfly Shrimp. Butterflying shrimp makes more surface area for the best part, the crunchy and crispy coating. Serve with cocktail sauce and lemon wedges for the perfect plate. In a shallow bowl, mix flour, salt, pepper, and garlic powder, set aside. In another shallow bowl whisk eggs with 1/3 cup of water, set aside. Mound some Panko breadcrumbs onto a plate, set aside. On another plate, sprinkle a light coating of panko and set aside. Carefully cut shrimp along the back and lay it open, be careful not to cut all the way through the shrimp. Coat shrimp in flour, shaking to remove excess flour. Dip shrimp into egg, allowing excess egg to drip back into egg bowl. 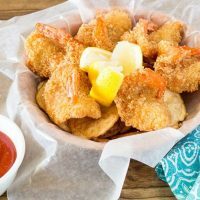 Place egg-coated shrimp into panko bread crumbs, cover with panko and press lightly, making sure all shrimp is covered with panko and the shrimp has remained open. Place coated shrimp onto the plate that was sprinkled with panko. Continue coating shrimp, adding panko to the plate as needed. You may need to use all 4 cups of panko, depending on the size of shrimp and thickness of egg wash left on shrimp. Once all shrimp have been coated and placed on the plate, place plate in the refrigerator for at least 30 minutes and up to 5 hours. Heat oil in a medium-size pan over medium-high heat until oil sizzles when a few panko crumbs are tossed in the pan. Fry shrimp in hot oil until shrimp are golden brown. Do not overcook, it will make the shrimp tough. Serve hot with cocktail sauce and lemons. Nutritional data assumes there are 30 shrimp per pound and 1 teaspoon flour, breadcrumbs and oil remain on each individual shrimp. Nutritional data will vary greatly in this recipe depending on oil temperature and amount of oil retained during cooking.